The remainder of the HU weekend is nice and chilled. We enjoy doing our own presentation and are further inspired by the other presentations. 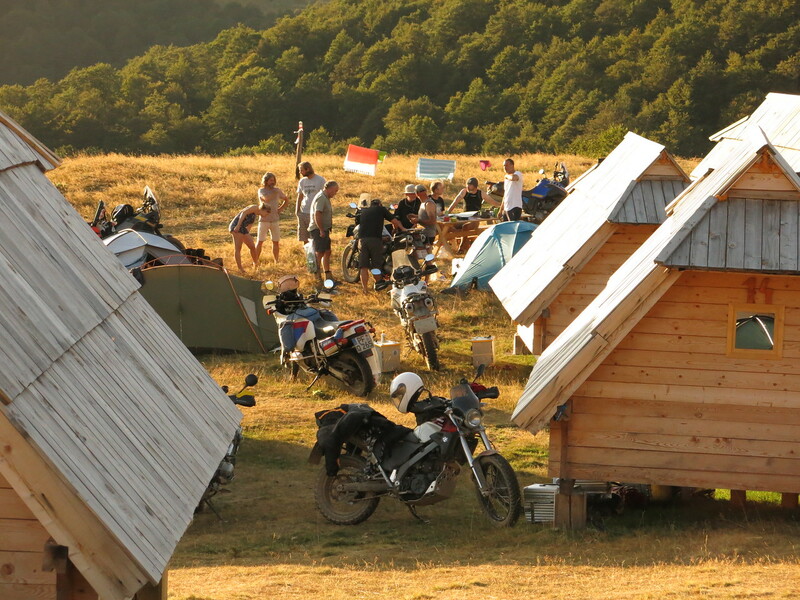 The camp site now has a pleasant buzz of all the adventurers sharing stories and admiring each others kit. It’s a lively atmosphere in a dazzling setting. There sure are some interesting characters attending this meeting. Graham Field has come over from his place in Bulgaria. It’s a pleasant reunion for us. 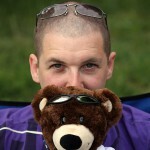 We had some fun times with Graham last year while I was working on the Terra’s engine at Motokamp. Many new faces for us as well. Interesting personalities and stories are plenty. Like Ali from Malaysia. 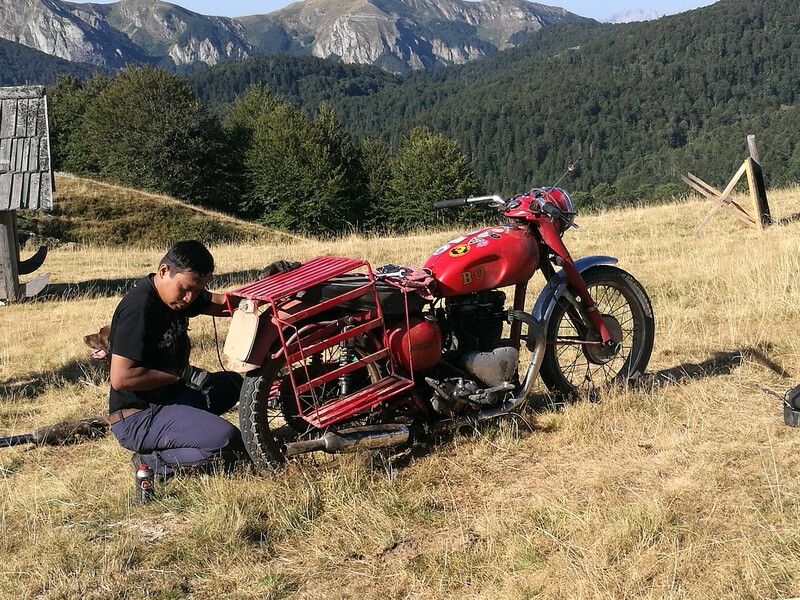 His Triumph Merlin is by far the oldest bike on the mountain. It is Ali’s dream to ride his classic bike back to the country where it was born and visit the Triumph factory in Hinckley. He’s very determined and by the looks of it, nothing will stop him from fulfilling this dream. Another visitor who has gone the distance is Abi from India. He as well rides a bike with a long British heritage. Contrary to the Merlin, Abi’s Royal Enfield was built in India though. 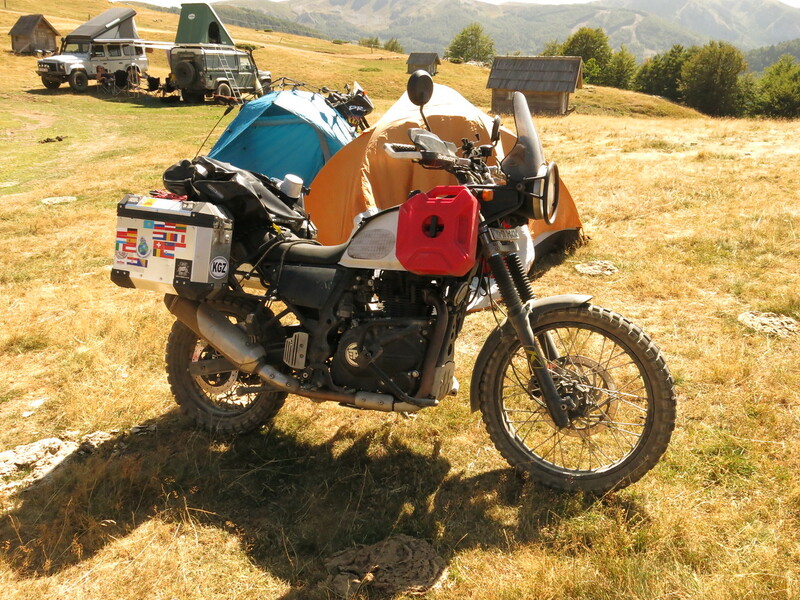 It is the first Himalayan we see in the flesh and we’re pretty impressed. 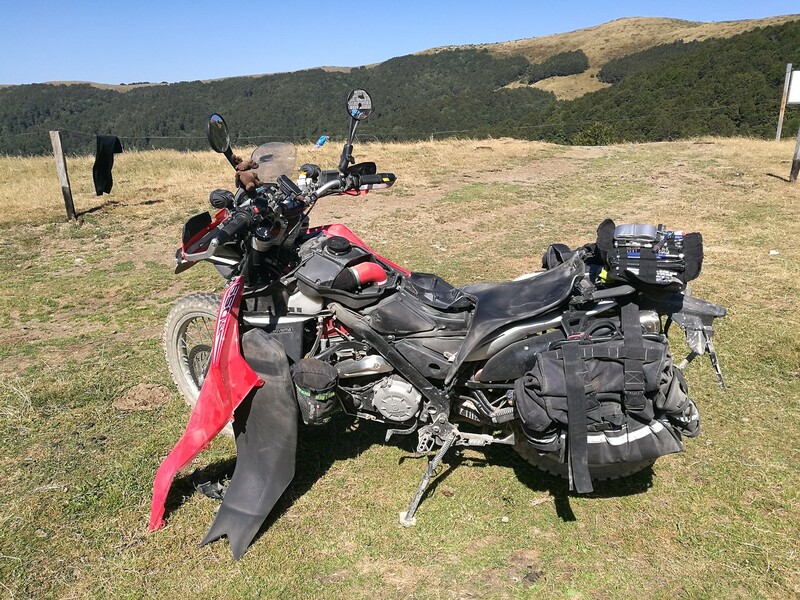 The bike caused a bit of a stir in the adventure riding scene when it was first announced. A small displacement bike, designed for travel and built in India, what to think of that? Abi rode it all the way to Mongolia and from there across Russia and around Europe. 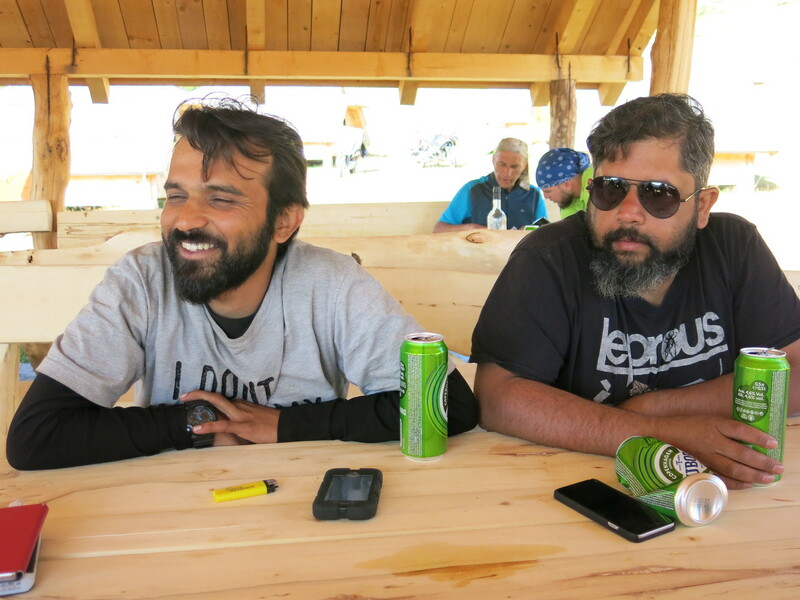 Besides a cracked frame in Mongolia he ran into a few minor issues, but nothing showstopping. As Abi says himself: bikes are either reliable or repairable, the two are usually mutually exlusive. Many contact details and Facebook friend requests are exchanged. And during the short time I manage to divert my attention away from all the distracting stories and kit I give our bikes some well-deserved TLC. Regular checks of the air filters aren’t exactly a luxury with the dusty conditions we’ve seen so far. Especially on my bike, as I usually let Sofie determine the pace on the more challenging trails. My bike (and its unfortunate rider) tends to swallow most dust because of that. When Sunday comes around the meeting comes to a close. Sofie isn’t feeling too well though. She had to get up a few times during the night with an upset stomach. She’s suffering from a migraine and feels a bit feverish. It has all symptoms of a sunstroke and there’s no immediate cure for that. Except rest and plenty of fluids, which she has some difficulty holding down. I get some breakfast while she recovers. One by one people start leaving after breakfast. When they’ve all said their goodbyes we’re left pretty much to ourselves on the camp site. As Sofie is still feeling bad and taking long naps, I don’t have a lot on my hands. 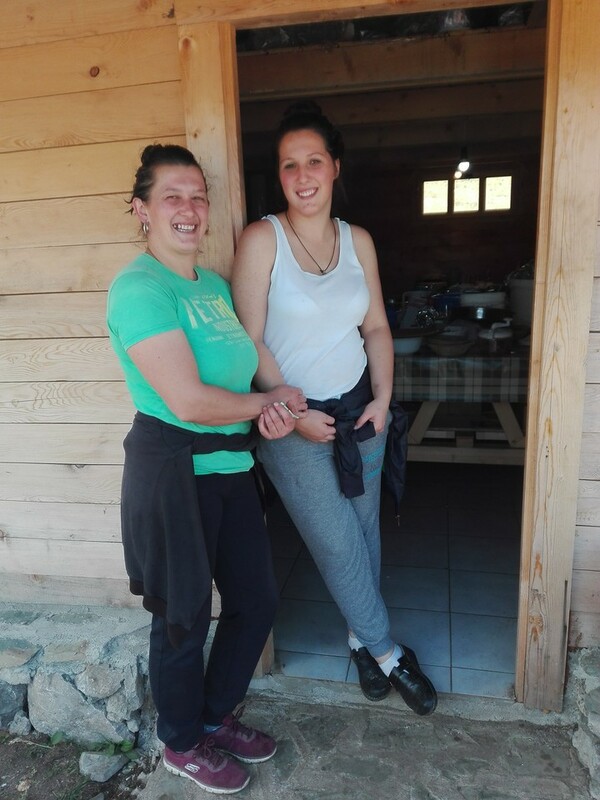 Anna and her daughters Jovana, Tijana and Ivana who are running the camp site on the other hand seem to have more work than they can handle at the moment. The large crowd kept them very busy during the weekend and the dishes have piled up. Meanwhile hikers and groups on horses continue to drop in for tea, sandwiches and lunch. I offer to help Ivana with the dishes while the other two girls clean the huts so Anna can take care of the food. Once in a while I check up on Sofie. 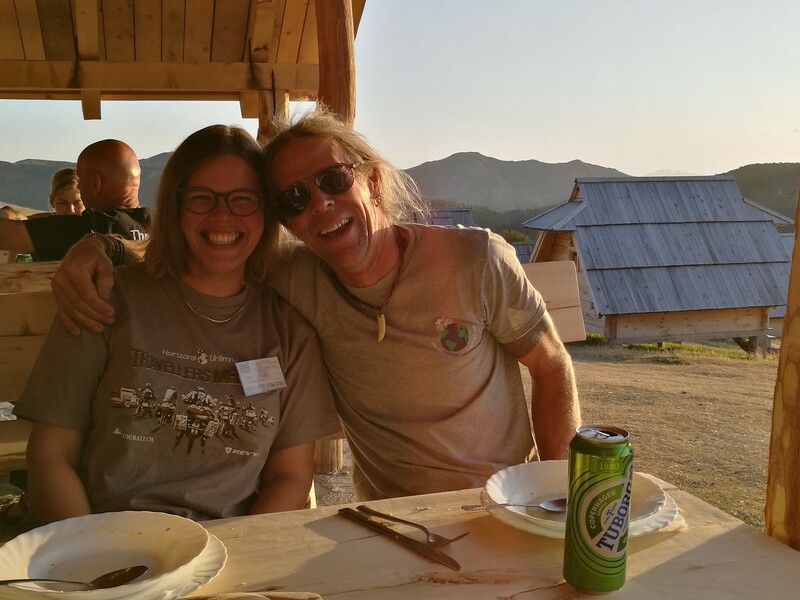 As she’s not feeling up to riding her bike yet, we decide to spend another night at Vranjak. But this time in one of the huts, because those offer a bit more comfort than our little tent. When dinnertime comes around she’s well enough to have some food. Just soup and bread for her, but it are welcome calories to recharge the body nevertheless.